Did a spray bomb mock-up just to get a feel for the color layout. 1- Any input on the white f/f, vs. blue? I'm building this off the EK seat for sure. black tuff's in the mail, too. red grips. 2 - decal size/layout? I tried dark blue but it seemed too dull. 3 - Color on the seat clamp, spider vs. silver? Darren Chan (DCBMX) on ebay has everything that was left when the factory closed. he sells them every now and then but if you message him he can hook you up if he has anything left. I have a NOS MX by Panda decal. What you see on the bike are my own layouts from magazine ads. they never existed like that nor would I be able to find anything. Great bike. I love the EK theme, but I'd stick with the white tuffs, maybe some red tires. Stunning bike, great memorial to a macho dude! Those bikes are beautiful you did a great job. Oh, one thing, the Panda's geometry, I think it's the new style. 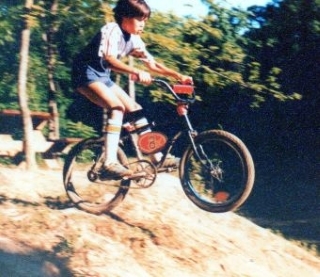 I think Panda was a head of its time no body put their seat post back that far even today. We anodized our brake levers and companies didn't come out with anodized levers years later. We had screw in bearing cups, till today nobody has them on their bikes and quarter inch automotive ball bearing in the front axle, crank, and rear axle. I hate to tell people these things but its History and I'm the only one that knows these things. There is a lots more first on our bikes but I'm running out of room. Randy, You should have Gary, the owner of this website, interview you. Panda has a BIG following on these sites and we'd all love to the hear the story. There is VERY little knowledge about Panda's history, other than a handful of advertisements and catalogs that have been gathered up. You'd be amazed and proude of some of the early Panda (w/suspension) builds that are currently occuring. what kind of cranks are on this build? does anybody know what brand cranks are on this build? im not sure this guy is a current member here. pm me thanks.